Gainesville + South Hall Trail Study – In 2017, the Gainesville-Hall Metropolitan Planning Organization, in partnership with City of Gainesville, City of Oakland, City of Flowery Branch, and Hall County, received transportation funding through the Federal Highway Administration’s Federal Metropolitan Planning (PL) Fund. The grant covers planning funds for two trail corridor studies. 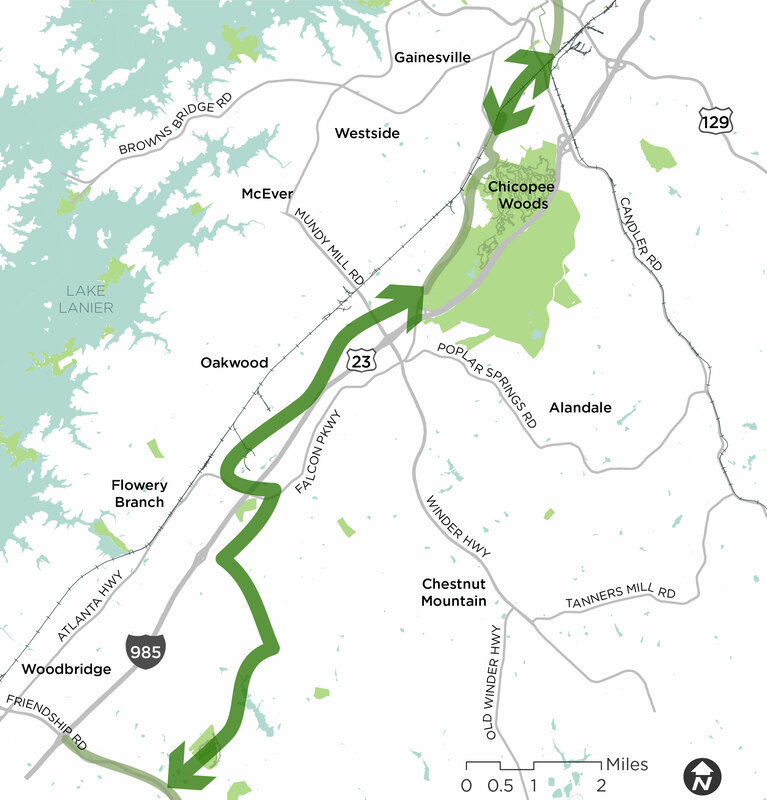 In 2017, the Gainesville-Hall Metropolitan Planning Organization, in partnership with City of Gainesville, City of Oakwood, City of Flowery Branch, and Hall County, received transportation funding through the Federal Highway Administration’s Federal Metropolitan Planning (PL) Fund. The grant covers planning funds for two trail corridor studies. Building on efforts by community stakeholders and local government agencies, the Gainesville and South Hall Trail studies will examine the feasibility of two trail corridors that provide a coordinated vision for active transportation investment and recreational outlet in Gainesville and southern Hall County. The study will develop project recommendations that maximize walking and bicycling potential in high-demand areas by connecting those areas with high-quality, comfortable, and safe trail corridors. The Gainesville-Hall Metropolitan Planning Organization is managing a Project Management Team for the trail study in partnership with Alta Planning + Design. The Project Management Team includes officials from the City of Gainesville, City of Oakwood, City of Flowery Branch, and Hall County. The trail study will determine a priority trail route that is accessible to all users and provides connectivity, recreation, and active transportation choices. As part of the process, we want to hear from you. The project team will be reaching out to community members across the study area to learn more about where you’d like the trails to connect, and how they might benefit economic development and quality of life. There are many ways to get involved and provide input. *Lines above are general about the study and not predetermined. Find us at one of several upcoming community events. Send us an email or use the form at the bottom of this page. As portions of the trail study are completed, they will be uploaded here for community members to review and provide feedback. Please check back regularly for updates. Questions or comments? Send us an email at info@gainesvillehalltrails.com or use the form. The Gainesville & South Hall Trail Studies are a project of the Gainesville-Hall Metropolitan Planning Organization (GHMPO). The project manager for GHMPO is Joseph Boyd, Transportation Planner. Alta Planning + Design, APD Urban Planning, and Long Engineering are the consultant firms conducting the study.